Every business needs a website to survive, but is your website getting as many visitors as you’d like? It’s a rhetorical question, really. What business wouldn’t want to increase visits? After all, when potential customers visit your website, you can increase brand awareness, educate consumers and drive revenue. However, you might be stumped on how to get more folks to visit your website. Not to worry. We’ve created this list of ten ways to increase visits. This list of actionable, do-it-yourself ideas is aimed at busy businesses just like yours. There are dozens of online directories that you can take advantage of. Think of them like electronic telephone books, but better. With online directories like YellowPages you can create a business profile, which includes a link to your website. Here’s an example. There are several benefits to online directories like this. First, you can make them as detailed as you’d like. From business hours to a profile picture, you decide how much information to put in. Second, they’re free. Any opportunity to increase your audience through a free service is worth looking into. Below you’ll find a list of the top five most popular business directories with links to get your profile started. You can also check out our post, The Top 20 Places Your Business Should Be Listed Online. Pro tip: For service-based businesses, Angie’s List is a great online directory. It has become the go-to spot for customers to find reliable service providers. Customers can rate your business and generate positive word of mouth. If you need some help getting your business listed in directories, our sister company, Orange Soda offers a service called LocalSync to manage your business profiles across 40+ local directories, apps and mapping sites to make sure your local customers get the right information every time. When it comes to social media advertising, you have a lot of options. However, one of the easiest ways to bump your website visits is through Facebook ads. When you set up an ad, Facebook asks you to pick an advertising goal. In this case, you can select ‘increasing website traffic’ as your objective. Once your objective is set, you have several ad options. A lot of small businesses chose to set up an ad that appears in the News Feed. This ad typically offers a discount on a product or service, which gives customers enough incentive to click on the ad and land on your website to place an order. Many businesses don’t have time to write and manage a blog. Instead, you can use your LinkedIn page as a mini blog. LinkedIn has a popular publishing feature that allows you to post articles right to your page. Your connections can see the post in their feeds. Not sure what to write about? Share your thoughts on recent industry changes, write a post about a news story that involves your line of work or talk about a new tool that’s helped your business grow. You want to write something that’s thought-provoking, not promotional. This idea is especially helpful for service-based businesses. When you’re selling a service, you want to show your authority in the niche. Of course, to send visitors back to your website, you have to include links. Make sure you link several spots within your post to lead people to your site. As a business owner, you have expertise in a certain field. Reporters are constantly looking for experts to help with stories. How do you connect with these reporters? Take a look at this website: Help A Reporter Out. On this site you’ll find a list of stories that reporters need help with. When you find a story that’s in your wheelhouse, you can send the reporter an email through the platform. If the reporter likes your response, he or she will reach out to you and set up an interview. You’ll be quoted in a newspaper article or blog post, and a link to your website will be included in the article. You need to set up an account, but you don’t have to pay to belong to it. It’s a great way to get free publicity for your business and drive traffic to your website. Pro tip: MyLocalReporter is like Help a Reporter Out, but in reverse. Business owners can search for reporters that fit their niche and reach out to them. It puts business owners in control, rather than waiting for a reporter to post a query that fits. For more tools to get free publicity for your business check out this post. Does your website serve as an informational placeholder? In other words, does it offer basic information about your business and product with minimal interactive features? If so, it might be time to upgrade. Many visitors expect a more interactive e-commerce experience. To get your website up to speed, check out Shopify. Using this do-it-yourself platform, you can create a website that has shopping features. You can set up a digital store, create an online shopping cart, enable credit card payments, collect taxes, set up shipping options and track your sales. If you don’t want to do a complete website upgrade, you can start by adding a Buy Button to your current website. It’s a nice way to take Shopify for a test run. Pro tip: When you use Shopify, you’ll be able to collect email addresses at checkout. VerticalResponse is integrated with Shopify, so all of those new contacts will flow seamlessly into your VerticalResponse email account. You’ll be able to use these new contacts to encourage even more website visits. With so many websites out there, you need to remind your audience to visit yours. How? Email. Your email list is one of the most valuable marketing tools you have in your arsenal. By sending targeted messages to your customers or clients, you can funnel them to your website to schedule an appointment or make a purchase. Get your customers to visit your website by emailing a promotion or an incentive. If you sell a product, offer a discount or free shipping. If you don’t sell a product, you can still use promotional emails, you just have to be more creative. An insurance business can offer free consultations, a cleaning service can offer 10 percent off services, a software company can offer free demonstrations to any company that sets up an appointment, and a furnace repair company can offer homeowners a free energy audit. There are no limits to promotional ideas. Offer free webinars, small gifts or ebooks. Hosting an event? Send invitations via email. First, make sure you have a page dedicated to your upcoming event on your website. Make sure that page has all of the event details on it, including a way to RSVP for the event. Now, head over to your email account and prepare an invitation. The call to action in this email will take the reader right to your event page. In addition, the email should contain at least one link to your website’s main page. When you have a new product or service, share it with your email subscribers. Describe what’s new, how the item benefits them, the cost and how they can get it. Your call to action should direct customers to your website where they can sign up for the service or buy the new product. Here’s an example of an email that Picjumbo sent out for a new product. Of course, you have to be careful. You can spend a lot of money on business swag, so you’ll want to come up with a plan. Have something like a brochure or postcard. Offer an educational reference that allows customers to recall your business or service later on. We also suggest a trinket or fun giveaway. Whether you opt for branded pens or key chains, it’s up to you. VerticalResponse offers a wildly popular brand box with over 1400 promotional items. Put your website on your business card. Every time you hand out a business card, you’re introducing a prospective customer or client to your business. If they want to learn more later on, they’ll look to your business card to get more information. Become a public speaker. Offer to speak at your local chamber of commerce meeting and be sure to include your website in your presentation. Hang fliers in local establishments. Ready to launch a new product? Hosting an upcoming sale? Create a quick flier with tear-off website information and hang them at local hotspots like laundry mats and community centers. Sponsor an event. When local charities are looking for sponsors, consider contributing. Look for possibilities where your name, logo and website are placed in front of an audience. For example, a local theater company could highlight your business and website in its programs. Use your vehicle to advertise. Every business owner travels around town. Why not advertise while you’re headed to the bank or post office? Consider purchasing a sticker for your back window or a magnet for the side of your car that has your business name and website on it. When you’re trying to promote your website, it’s good to get creative. Here are a few out-of-the-box ideas to turn heads and drive website visits at the same time. Chalk art advertising. Know an artist? Several brands have had success with chalk art advertising. When Planet of the Apes came out, Warner Brothers used these chalk drawings to promote word of mouth and website visits. Flash mob. Ready to get your groove on? Try a flash mob to promote your website. What’s a flash mob? It’s a group of people who meet in a public place and break out into a choreographed dance. Leave your website address in chalk on the sidewalk behind you, or hand out fliers to the audience after. Project your website on your building. Turn heads with a projection of your business name and website on your building. 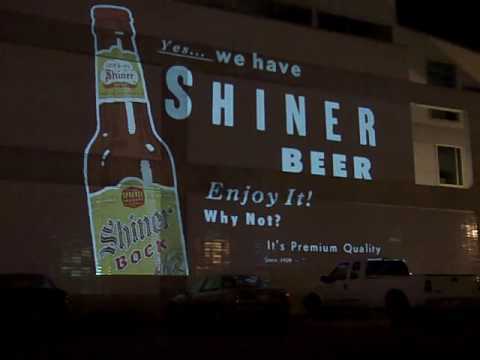 Projection advertising is a popular way to drum up attention, so why not give it a try for your business? You can go all out and hire a company to do something like this, or you can buy a small projector and project your website address in your window at night. How do you get more visits to your website? Please add to our list in the comment section below.